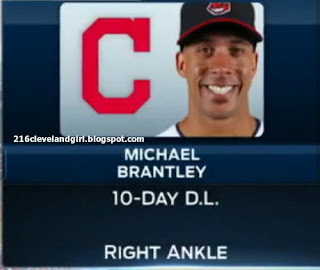 today, on June 19, the Cleveland Indians announced that Michael Brantley was removed from the Paternity List and placed on the 10-Day DL with a right ankle sprain, retroactive to June 16. he is eligible to return on June 26, as long as he receives clearance from the medical staff. this is Michael's first DL stint of the year. May 7 against the Kansas City Royals. it occurred during his second at bat, when he awkwardly stepped on 1st base while trying to beat out a grounder in the top of the 3rd inning. Michael was facing left-hander Danny Duffy with Carlos Santana at 1st base and 1 out in the scoreless game. after running the count full, he hit a little dribbler that bounced in front of home plate and didn't get too far up the 3rd baseline. Duffy backed off as his catcher, Salvador Perez, ran to the ball on the infield grass and threw out Michael at 1st on a close play. (the full at bat can be seen at the 3:10 mark in this video on indians.com.) Michael went out to play left field for the bottom of the 3rd before he was subbed out defensively for the bottom of the 4th. while not considered a serious sprain, Michael missed the entire series against the Toronto Blue Jays, from May 8-10, before he returned on May 12, following a Tribe off day on May 11. (daily detailed updates can be found in the Right Ankle Sprain section of my Brantley's May 2017 #s blog.) and no one spoke of any recurrent ankle issues for Michael until now. apparently, he's been dealing with continued soreness from the sprain he endured in the Kansas City series, according to the Indians on twitter. Michael has been unavailable to play with the Tribe since June 15, when he left the team to be with his wife, Melissa, who was about to give birth to their son, Maxwell. Michael missed five games between June 15-18, including a doubleheader in a four-game series against the Minnesota Twins. the Indians incredibly won all five games in his absence. Michael is now with the team on the road in Baltimore, but obviously still cannot play. for more information about Michael's new baby boy, please read my previous post: Brantley Placed on Paternity List. it was quite unexpected that on the day Michael was supposed to come off the Paternity List, he ends up on the disabled list. not to mention, there is some definite confusion as to what Kansas City series is being referenced here. i find it very strange that he'd been experiencing ongoing soreness from an injury that took place six weeks ago. should he not have just gone on the DL in May then if that was the case? since returning to the Indians on May 12, Michael played in 28 games prior to his paternity leave. if he was playing hurt for any part of that, it sure was hard to tell based on his .308 batting average (33-for-107). he also tallied nine doubles, 11 RBI, nine runs, 12 walks, and four stolen bases over that time period. in the field, he additionally acquired four assists and committed one error. he and/or the Indians hid his problem well. and if he re-injured his ankle in the latest June KC series, well, that was never publicly acknowledged either. "this has been bothering him for a while," Terry Francona disclosed during his pregame media session via Paul Hoynes' article on cleveland.com. "on Tuesday and Wednesday night he did a ton of running (against the Dodgers). it was grabbing him. so when his wife had the baby, i told him just go and be with her. it wasn't fun not to have him, but i thought it would be good for him. "over the weekend, it just wasn't getting better to the point where we liked it. with the 10-day DL, why not give him a chance to get it where he's not limping around all year? he just needs a little bit more time." SportsTime Ohio's Matt Underwood also interviewed Tito before the game against the Baltimore Orioles. from a video on the FOX Sports Ohio youtube channel, the manager addressed Michael's ankle sprain further. "Tuesday [June 13] and Wednesday [June 14] against the Dodgers, he did a lot of running. and we knew it had been bothering him for a while. so, on the Thursday [June 15], the day his wife was having a baby, i told him, i said, 'just go with her.' even though the Paternity didn't start until the next day, i said, 'go and be with her.' i think we hoped that that weekend would really calm that thing down. he's still feeling it. so with the 10-Day DL in place now and able to backdate it three days, he would only have to miss another week and it would give him a chance to finish up the last 85, 90 games hopefully not limping around. we've all found that he's willing to do that. just trying to be fair to him." on the contrary, Andre Knott, in-game reporter for SportsTime Ohio, tweeted that Michael's ankle has been bothering him for over a month. so does that clarify things for anyone? lol maybe it was a matter of the ankle never fully healed after the initial May sprain, and then he tweaked it again in June, coincidentally during another KC series, which exacerbated the pain that he already had, and the Indians didn't tell anyone until today. let's go with that. if you're keeping count, this is Michael's fourth appearance on the disabled list in his big league career. his first trip to the 15-Day DL came on August 26, 2011, when he was dealing with right wrist pain, which turned into a broken hamate bone. after that, despite minor issues here and there, Michael steered clear of the disabled list for his next four seasons. he seemingly made up for that in 2016 by going on the DL twice. Michael opened the season on the 15-Day DL while still recovering from offseason shoulder surgery. then he landed on the 15-Day DL once more on May 14, the day before his birthday, with right shoulder inflammation. he was later transferred to the 60-Day DL on July 3, and that's where he would remain for the duration of the year. when will Michael resume play with the Indians? will he need to go out on a minor league rehab assignment before he can rejoin the team? i don't know. so follow me on twitter @clevelandgirl23 because i will be tweeting all the latest updates on his condition as more news is released. and if you'd like to receive notifications whenever i post my blogs, you can sign up for my subscription list by entering your email address in the box underneath the Blog Archive sidebar over on the right side of this page. PS: don't forget to vote for Michael to go to the 2017 All Star Game! i bet that'll make him feel better! he's currently batting .296 (61-for-206) with 13 doubles, 5 home runs, 28 RBI, 24 runs, 20 walks, 7 stolen bases (6 - 2nd, 1 - 3rd), 1 caught stealing (2nd), and 35 strikeouts (30 strikeouts, 5 looking) in 54 games. defensively, he's recorded 89 putouts and 5 assists, but committed 1 error in left field.